Wouldn’t it be nice to be allowed to vote using a secure online platform that provides transparency into elections results? Follow My Vote has created end-to-end verifiable online voting software that is open-source and truly revolutionary. The infographic below describes the end to end process of using our blockchain voting system to vote in an election. To learn more about blockchain technology, how it works, and how we actually use it in our voting platform, please visit our page on Blockchain Technology in Online Voting. 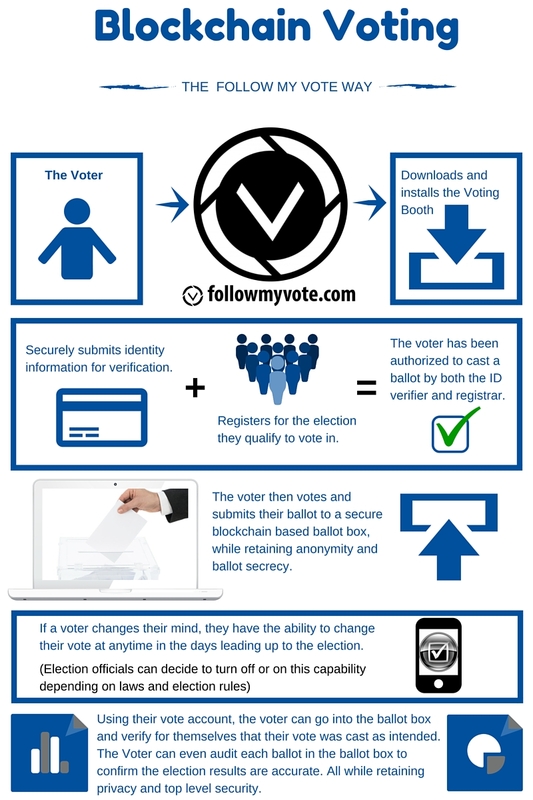 To summarize the above infographic, Follow My Vote is simply taking the current process of voting in an election on Election Day (in a state with Voter ID laws) and bringing that process entirely online, in an attempt to make it easier, more secure, and even more cost effective for everyone involved. When using our blockchain voting system, the voter would download and install the Follow My Vote voting booth on the personal device of their choice (i.e. desktop computer, laptop computer, smartphone, or tablet). From there, the voter would submit the appropriate identity information in order to have their identity verified by an Identity Verifier, which would be approved by the organization hosting the election ahead of time. Once their identity is verified, the voter would be able to request their ballot, at which point they are issued their correct ballot type by the Registrar. The voter would then complete their ballot and securely submit their vote(s) to the blockchain-based ballot box. To obtain proof of casting their ballot, the voter would have the option to print out a receipt. If allowed by the organization hosting the election, the voter may vote early and could even re-enter the Follow My Vote voting booth to change their vote if they change their mind in the days leading up to the election. When the polls close on Election Day, the most current votes submitted by each voter would be considered the official votes; and, voters would be allowed to follow their vote into the ballot box to ensure that their vote was cast as intended and counted as cast. If they choose to do so, each voter would also be allowed to audit each ballot in the ballot box to confirm the vote totals being reported by our blockchain voting system are accurate, without revealing the identity of each voter. At Follow My Vote, we want every voter to have faith in the democratic process, trust in their government, and feel like their voice matters. To this end, our blockchain voting solution provides voters with a way to confirm that their voice has been heard and that election results, as a whole, are truly accurate. To learn more about the ID Verification and Registration steps of our process and how it ensures each voter’s right to privacy within our online voting system, please visit our page on Cryptographically Secure Voting. Pingback: Online Voting – Direct Democracy U.S. This isn’t the problem they are trying to address? Dear, Sirs, Mme, Professor could it be possible to focus some application of your research in improving safe and fraud free voting process for Democratic and transparent free and fair election process in third world countries, so as to get ride of the highest cause of dictatorship Bad governance,election rigging , corrupt governance,civil war and social crises in third world countries. Helping transparency in election and good governance shall helps builds a better and peaceful world. What is a voter asks any favor or money from the candidate or people campaigning for the candidate?